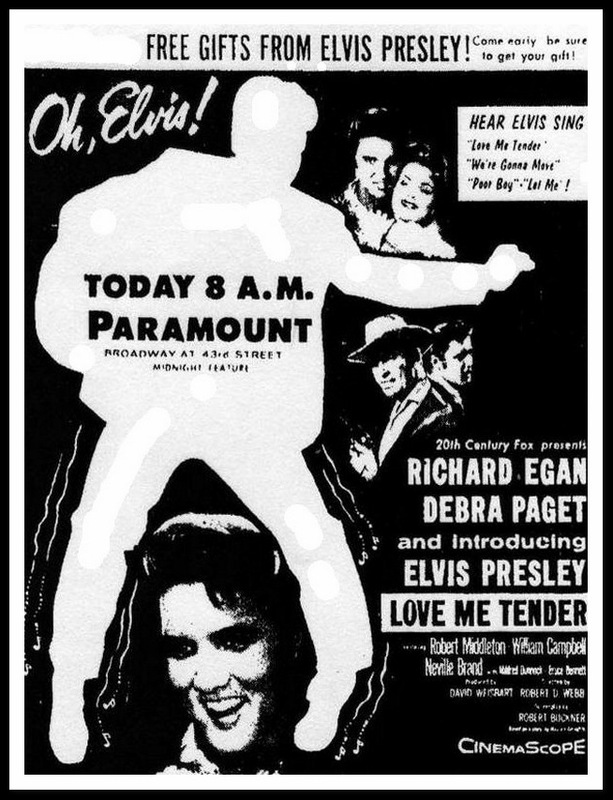 In this article we take a look at the big premiere of Elvis’ first movie at the Paramount Theatre in New York. 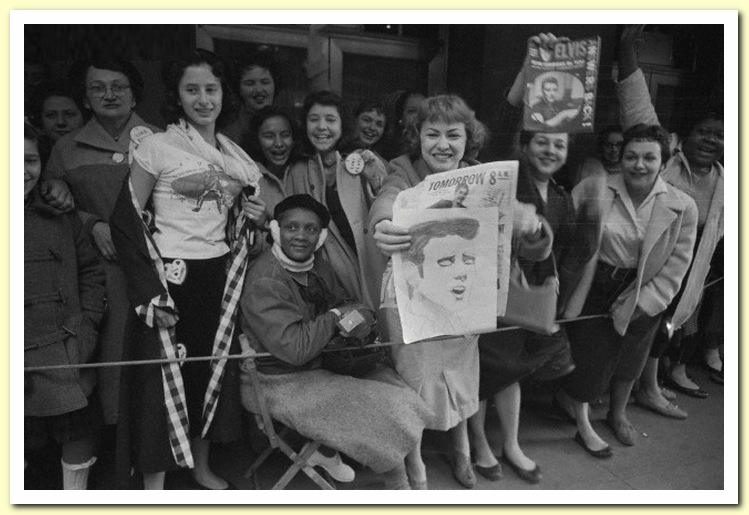 No expenses were spared in order to launch Elvis’ moviecareer and further deepen his already meteoric rise to fame in late 1956. 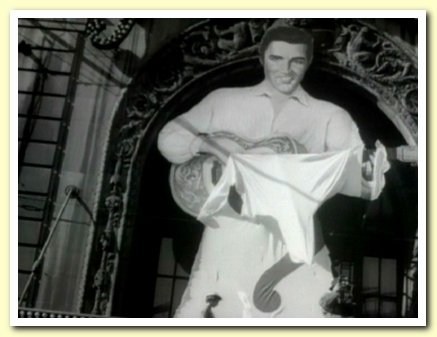 With the premiere of Love Me Tender, Elvis had now also arived in Hollywood, and he had arived with a big bang! 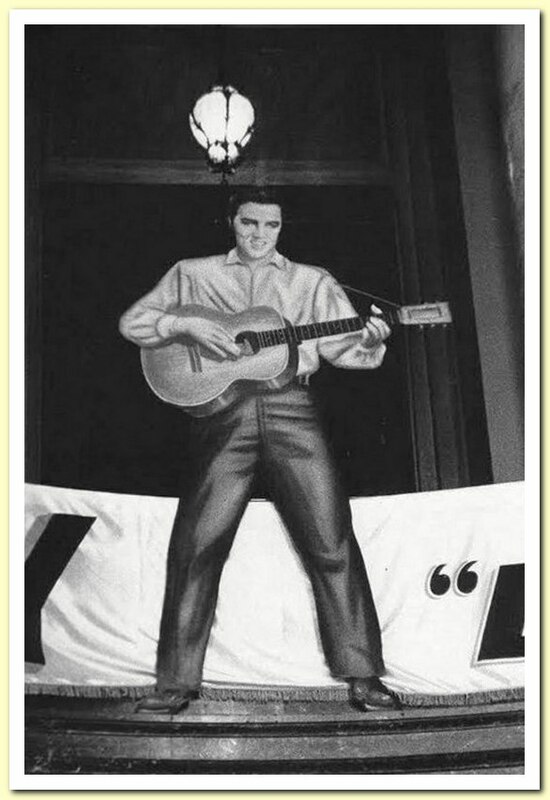 Elvis seemed to be all over the place at the same time (either in the flesh or in a cardboard version). 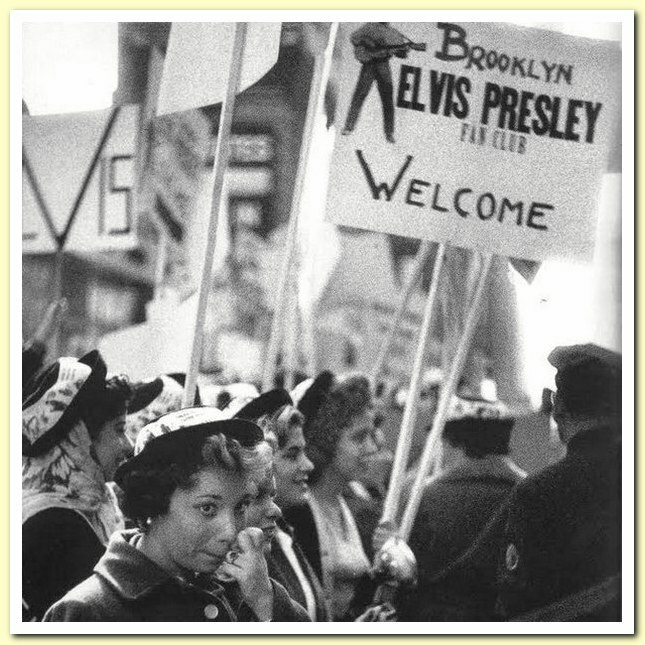 Due to the clever marketing schemes by Presley’s management, Elvis ruled the media. And not just on the eastcoast! 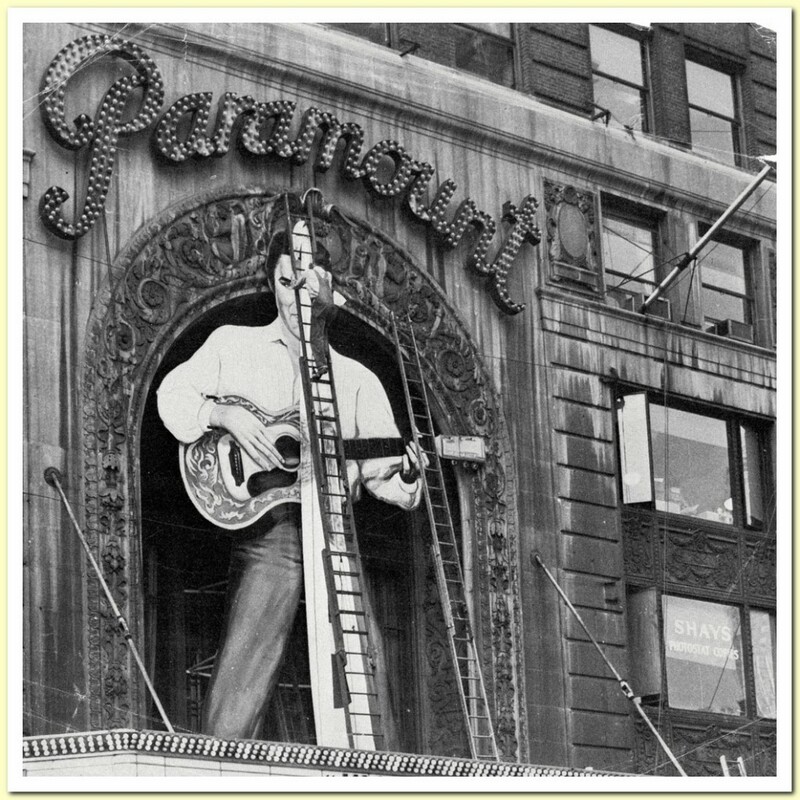 On this day a HUGE Elvis cut-out on top of Paramount‘s marquee was unveiled. 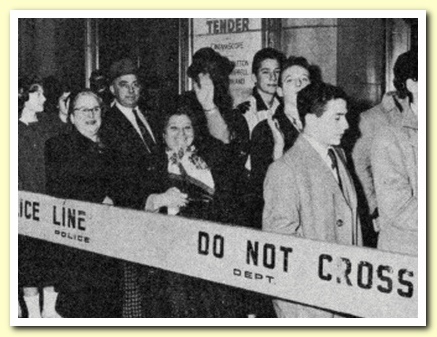 On the photo to the right we can see that the cut-out is about to be covered up. 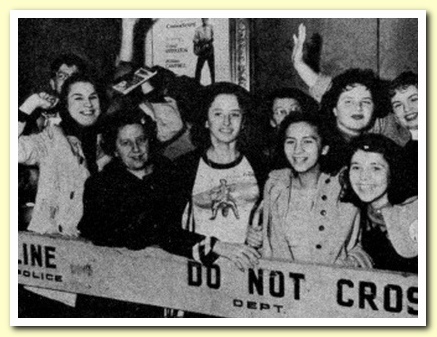 The movie would not premiere until 2,5 weeks later. 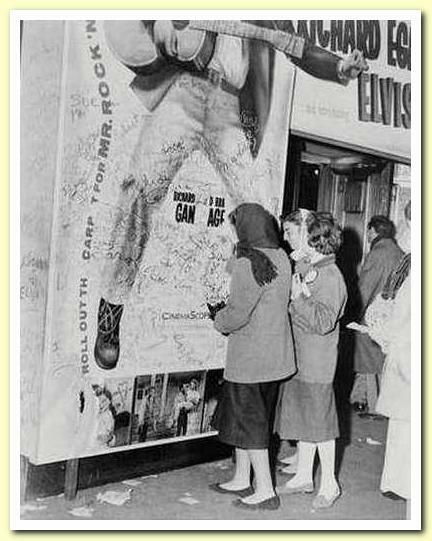 So in the weeks that followed, this cardboard Elvis Presley would take control of Times Square. 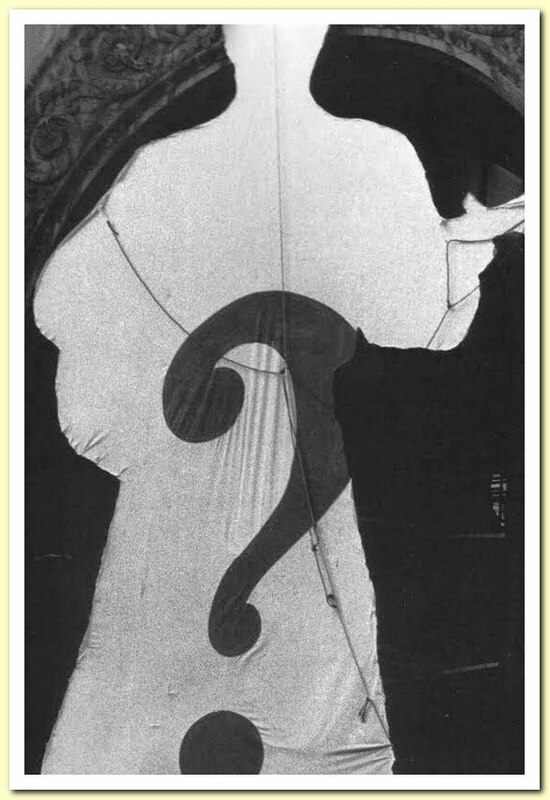 Here we have some pictures of the unveiling of the not so mysterious ‘mystery-man’. 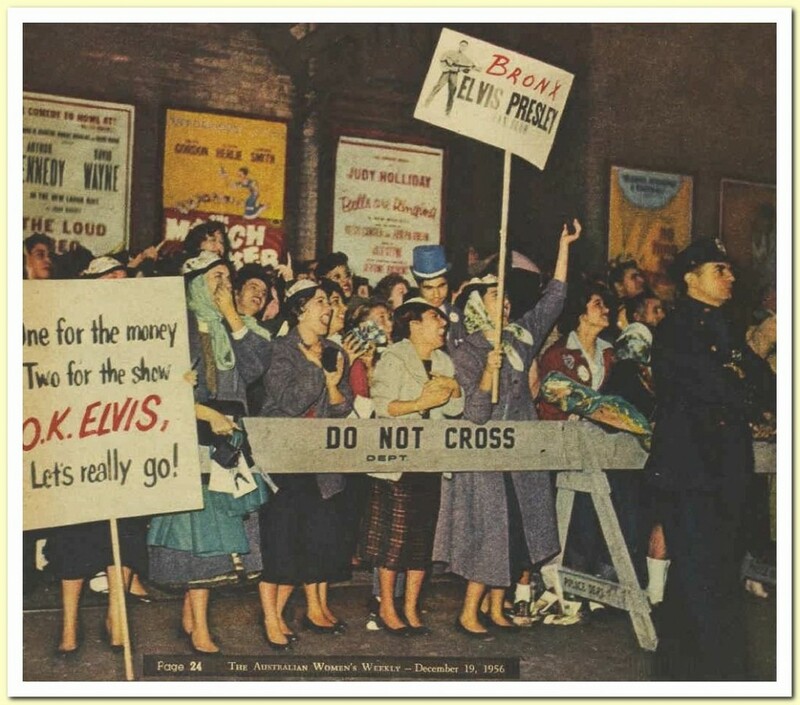 Apart from the signs mentioning local Elvis Fan Clubs, all other signs were clearly not a product of homemade creativity but merely the result of the very clever marketing scheme thought out by one Tom Parker. 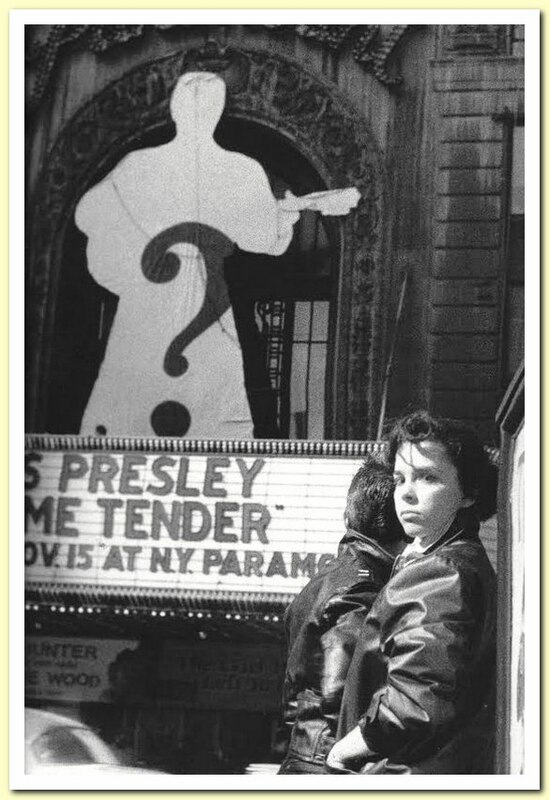 On the marquee we can see that The Girl He Left Behind was playing at the Paramount in the week the cut-out was unveiled. 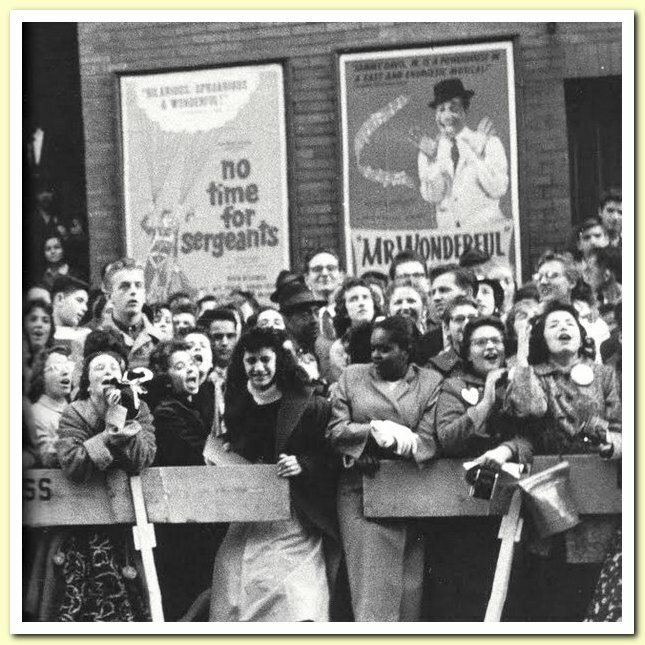 It starred Natalie Wood, and even though it’s all a coincidence it’s interesting to note that Elvis dated her for a while, that both Natalie and Elvis are linked to RCA Victor, that Elvis was asked to play the role of Tony in West Side Story (opposite Natalie in 1961), and that Elvis gave one of his most memorable answers during the March 1960 Graceland press conference when he referred to Priscilla as “The girl he left behind“. This photo is interesting for a couple of reasons. 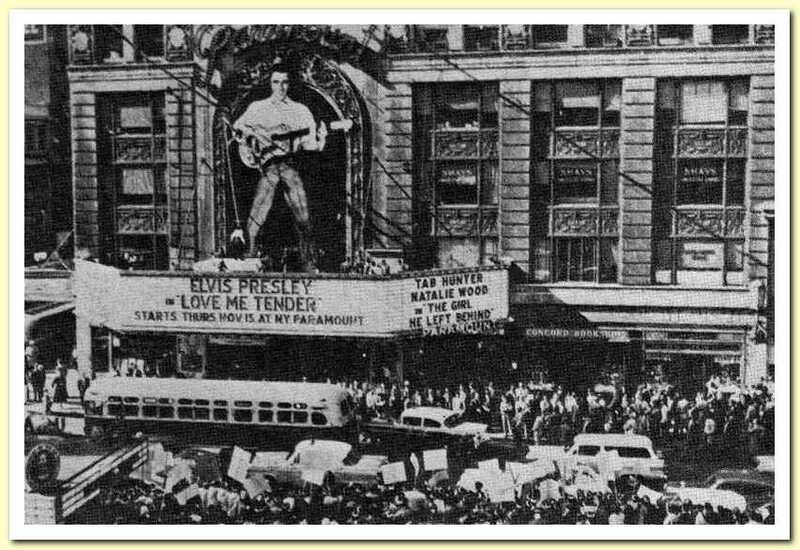 First of all, it was taken by someone who was inside the Paramount Theatre at that moment of the unveiling of the Elvis cut-out. 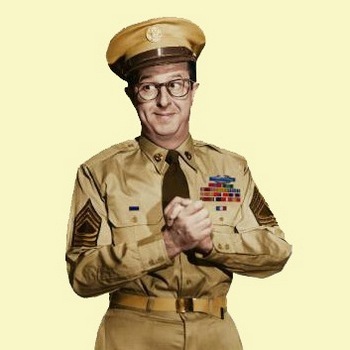 But we can also see good old Sgt. 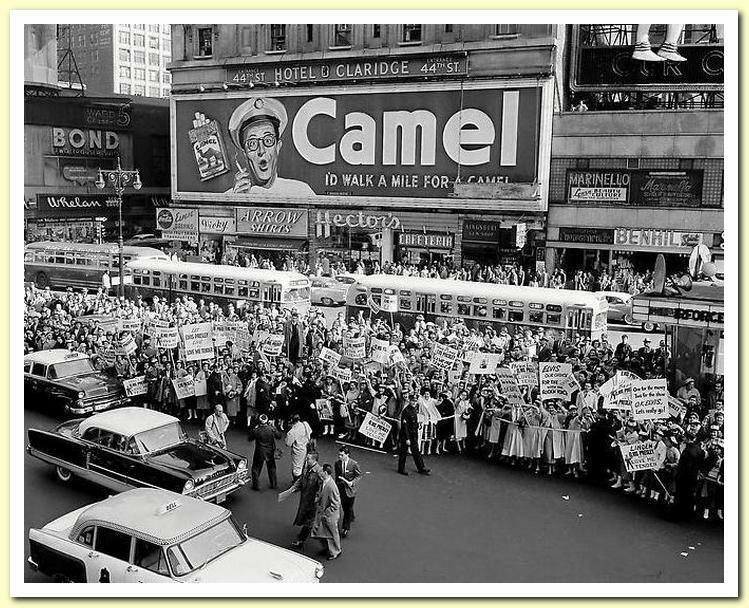 Bilko across the street on the Camel billboard, as a silent witness to Elvis Presley’s first ever movie Premiere! 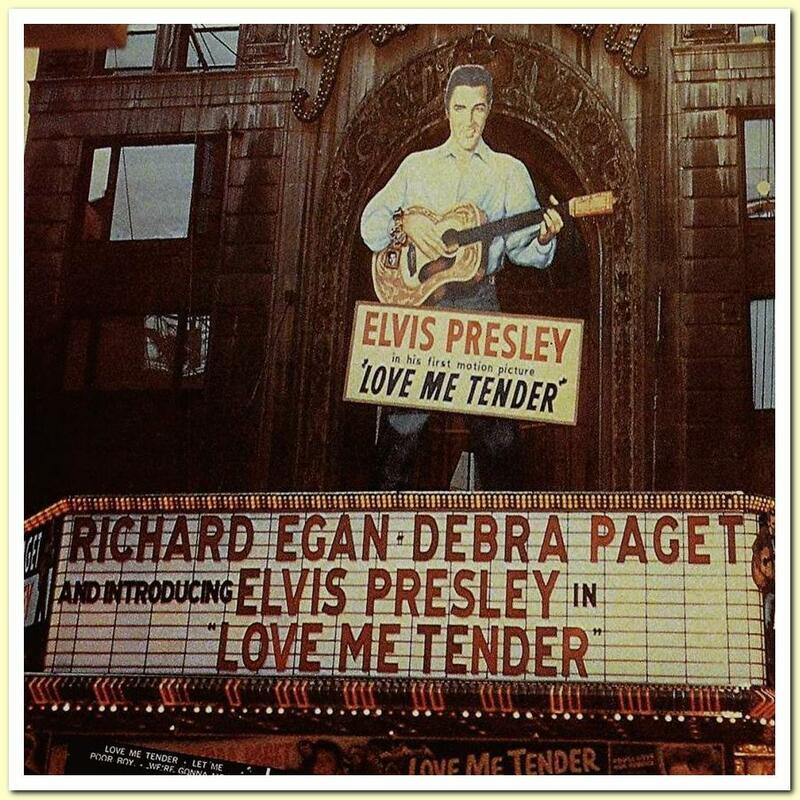 On the same day Elvis performed on the Ed Sullivan Show. 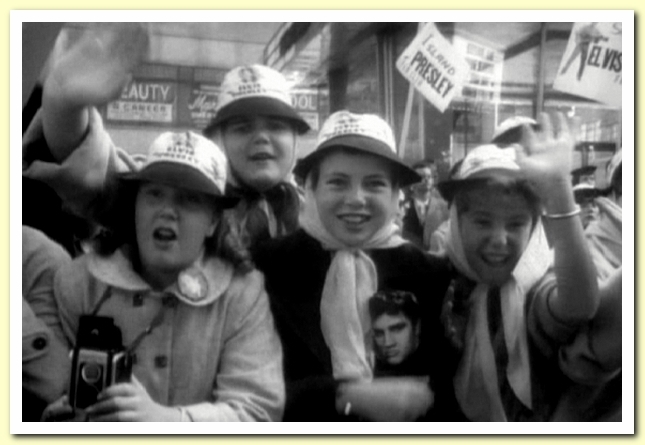 The same fans, with the same signs, wearing the same EPE hats, lined up outside Studio 50 while Elvis was rehearsing. Way to go Colonel! 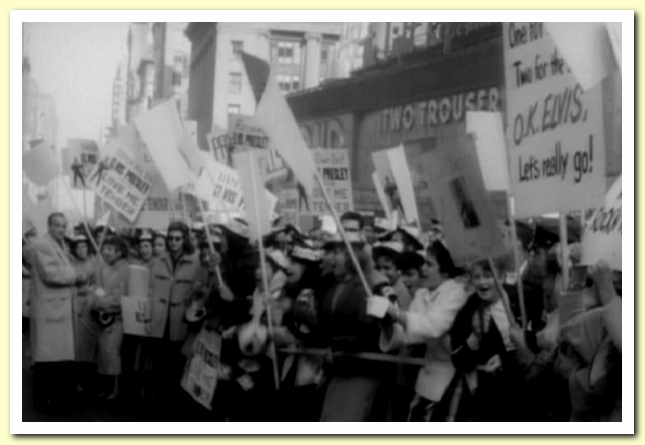 In the pic below we can spot the same group of girls as in the photo directly above the color pic to the right. And here the same girl in the white t-shirt (picture below) pops up yet again. 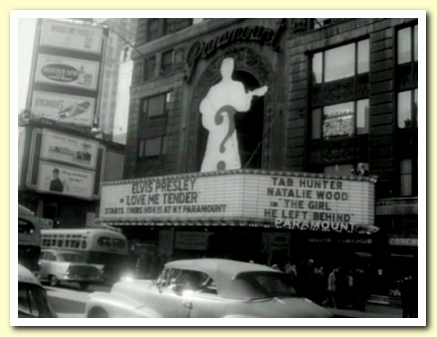 This is probably the only image available that shows us how the Paramount looked like between October 28 (the unveiling) and November 15 (the premiere). 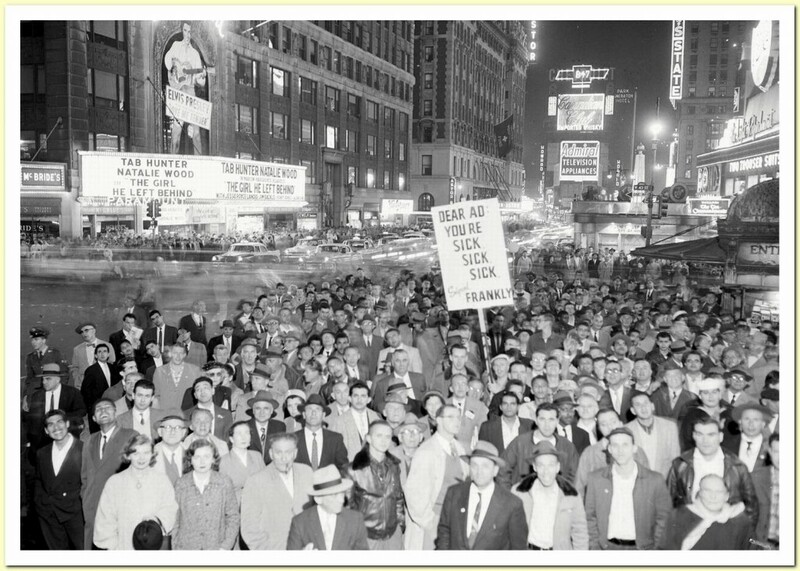 The people on the foreground (and also on the other side of the street) were there for a political reason, and that sign (aimed at democratic candidate Adlai Stevenson) was not provided by The Colonel. 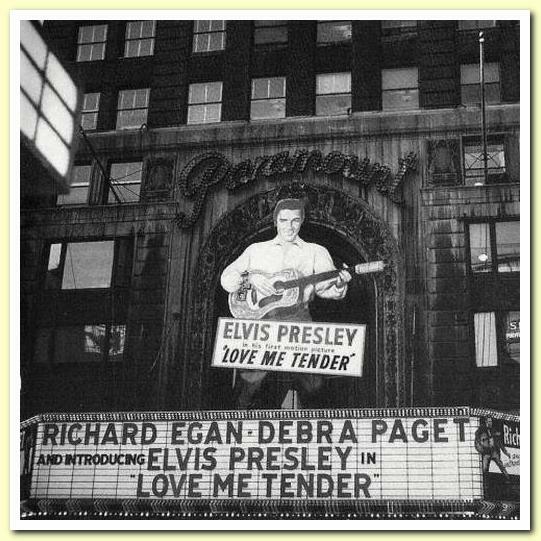 The reference to Love Me Tender on the front of the marquee (“STARTS THURS. NOV. 15 AT NY PARAMOUNT”) is gone and the marquee is back to how it will remain until the day of the premiere. This photo hands us a real nice overview of Times Square, and we can see how large the cut-out actually is. 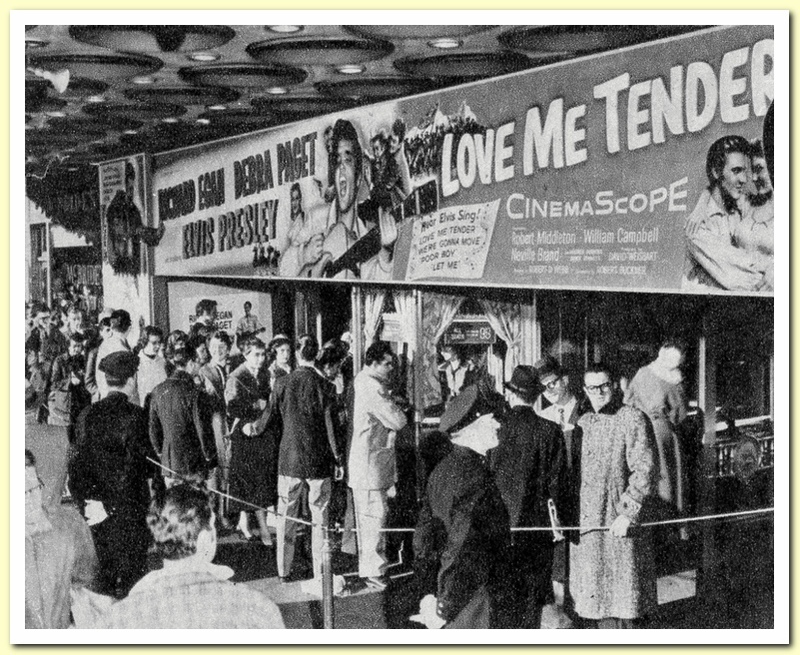 In the days prior to the big premiere, these ads appeared in New York’s newspapers. To the right the ad of tuesday the 13th. Below to the left we have the one for wednesday the 14th. 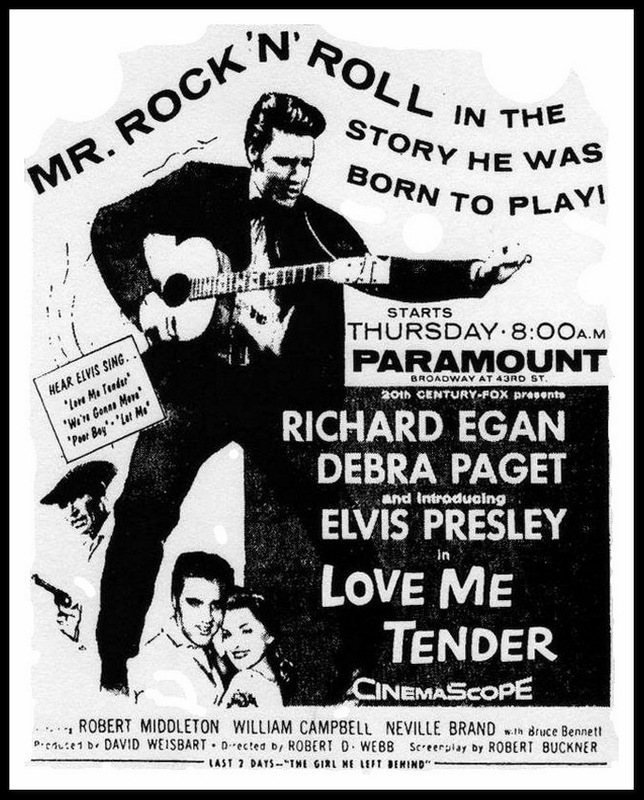 And next to that we see the ad from the day of the premiere (thursday the 15th). 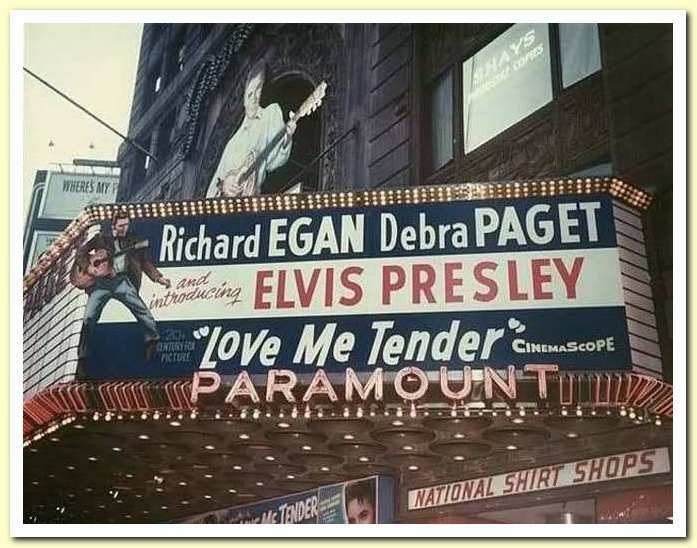 Love Me Tender premiered on this day at the Paramount. 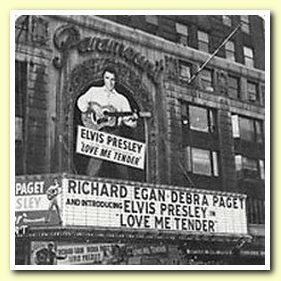 We can see that the names on the marquee have changed, Elvis is now 3rd billed (“and introducing …”) after Richard Egan and Debra Paget. 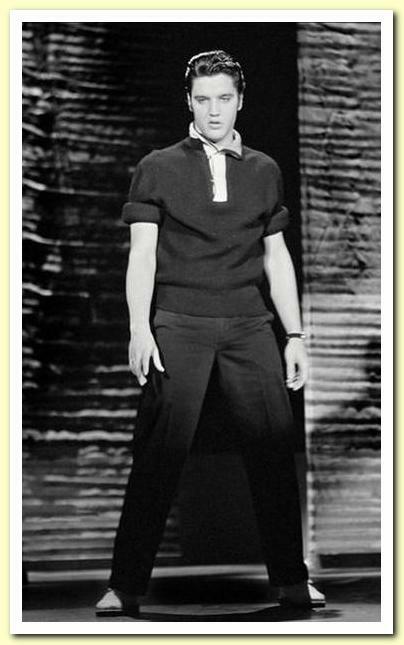 But all the focus is stull fully on the boy from Tupelo. 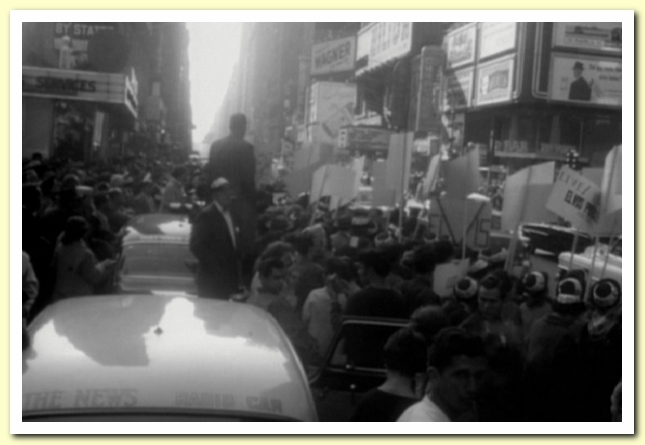 So far (and to my knowledge) only two color images have ever surfaced from the day of the Premiere on Times Square. 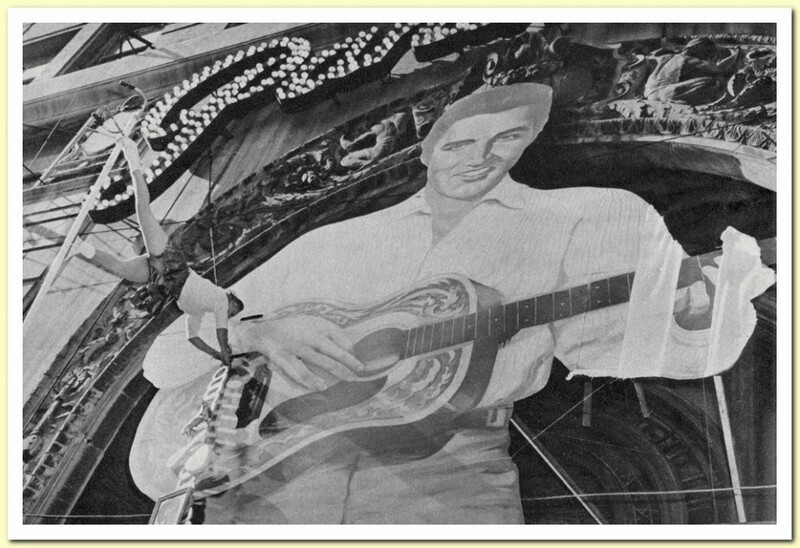 The image below appears to be the same as the image to the right, except that it is much less cropped (and in b/w of course). 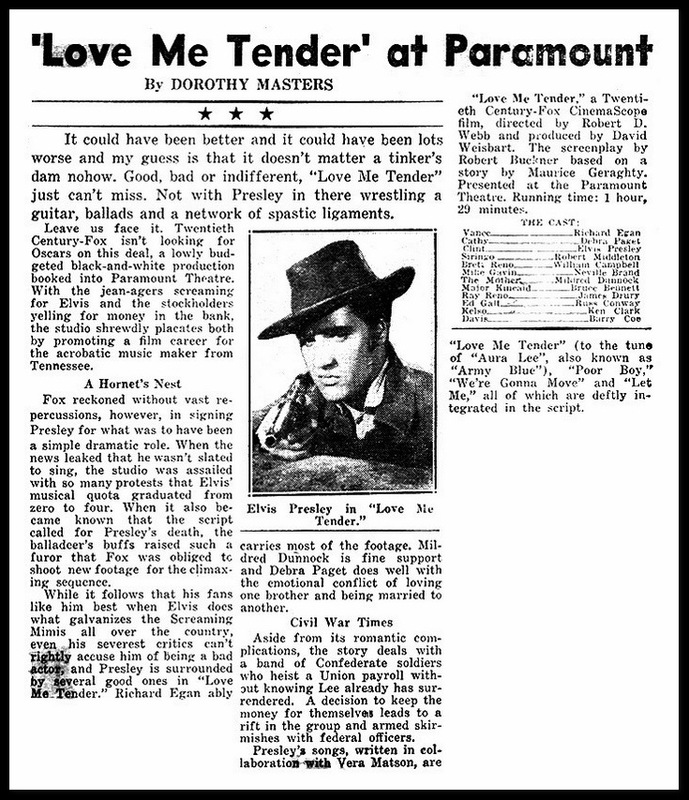 Here we have a review of the premiere at the Paramount from next day’s paper. The article confirms that the movie would be a commercial success no matter what. 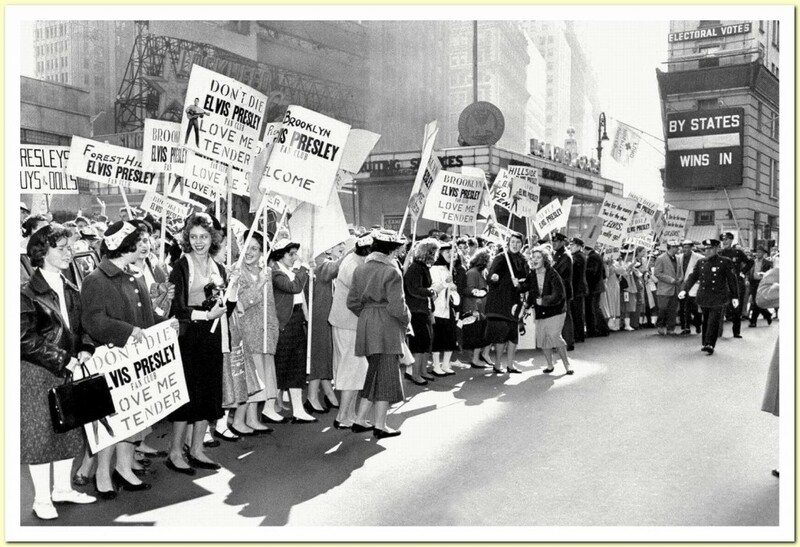 The huge promotion-campaigns had made sure of that. 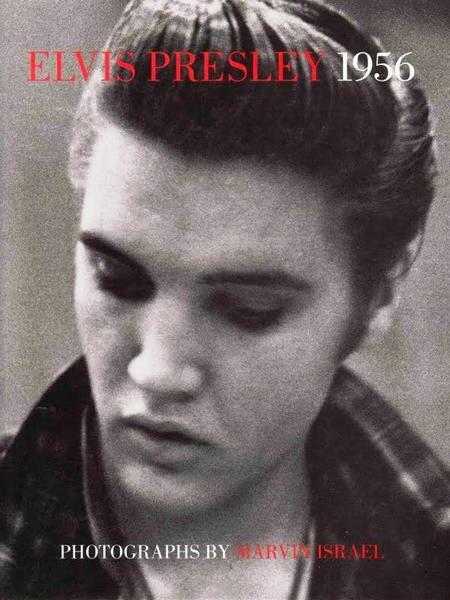 Presley’s “network of spastic ligaments” is one way of describing Elvis’ acting abilities, but the author also mentions that “even his severest critics can’t rightly accuse him of being a bad actor”. 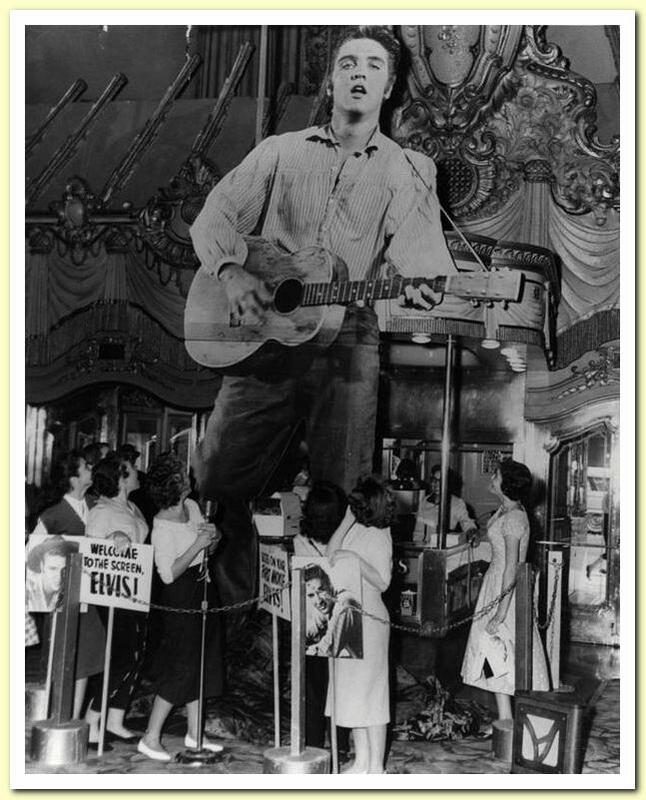 A similar marketing campaign was held on the westcoast of the USA were a huge cardboard Elvis (though much less tall) accompanied the movie. 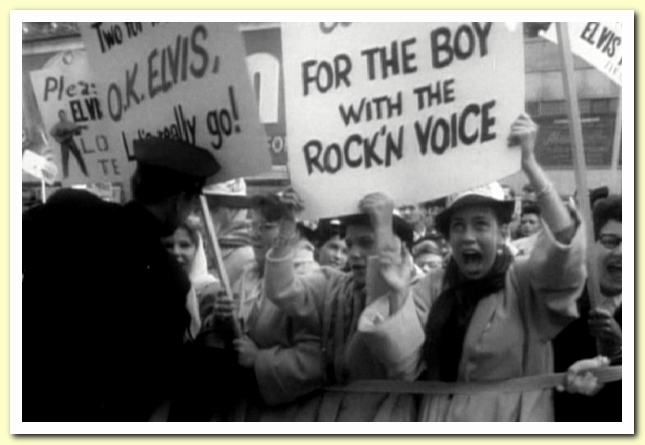 And also the fans holding the signs that screamed Elvis’ name were present! There were no hysteric fans dressed up in EPE wear holding up signs. 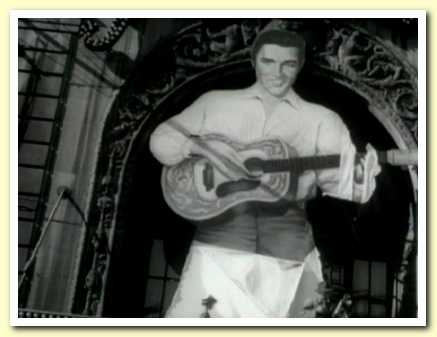 But there was a cardboard Elvis that decorated the marquee in Texas. 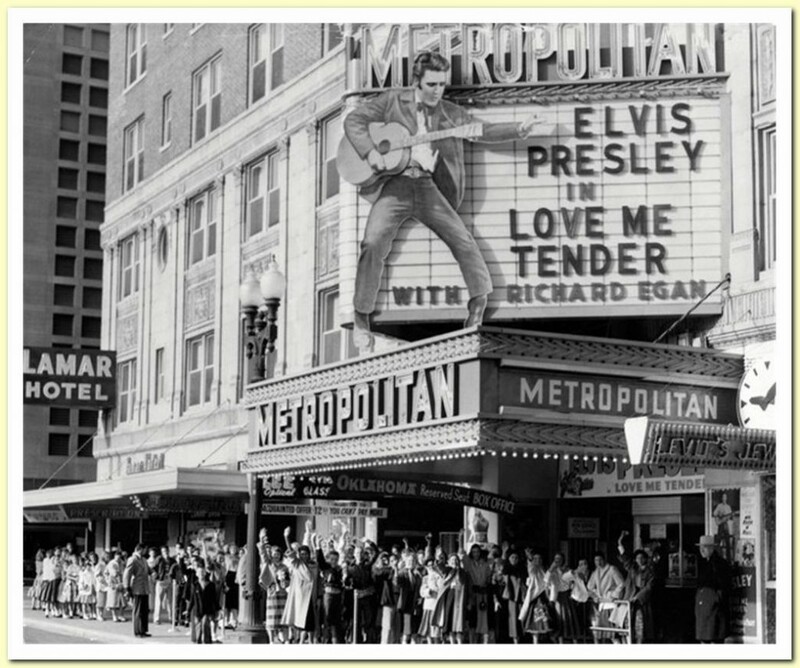 In this photo we can see that Love Me Tender is being announced in Elvis’ hometown. 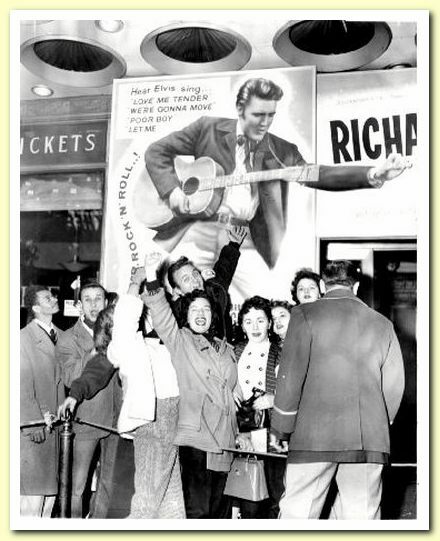 Presley watched a private screening of the movie here, prior to its nationwide release, on November 20. 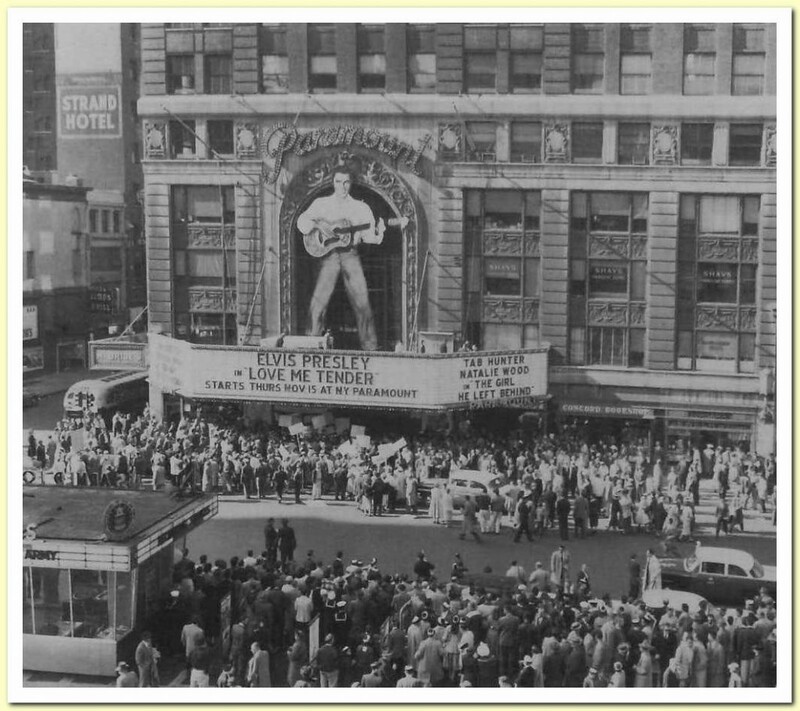 I am not sure if this is actually the Embassy Theatre in Fort Wayne. 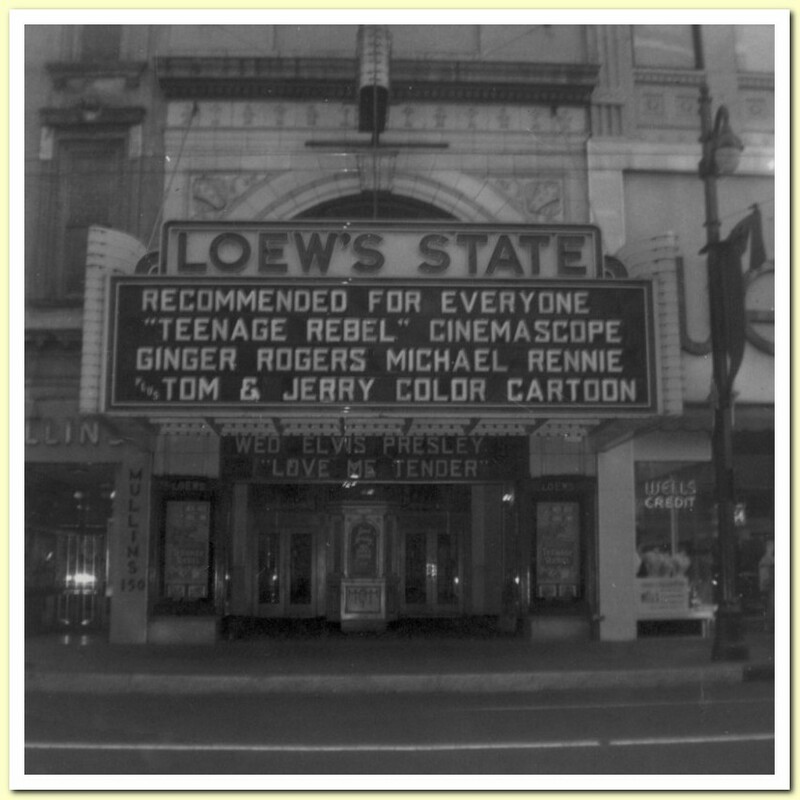 Can anybody confirm the (real) location of this theatre? Not much is known about this interesting image. 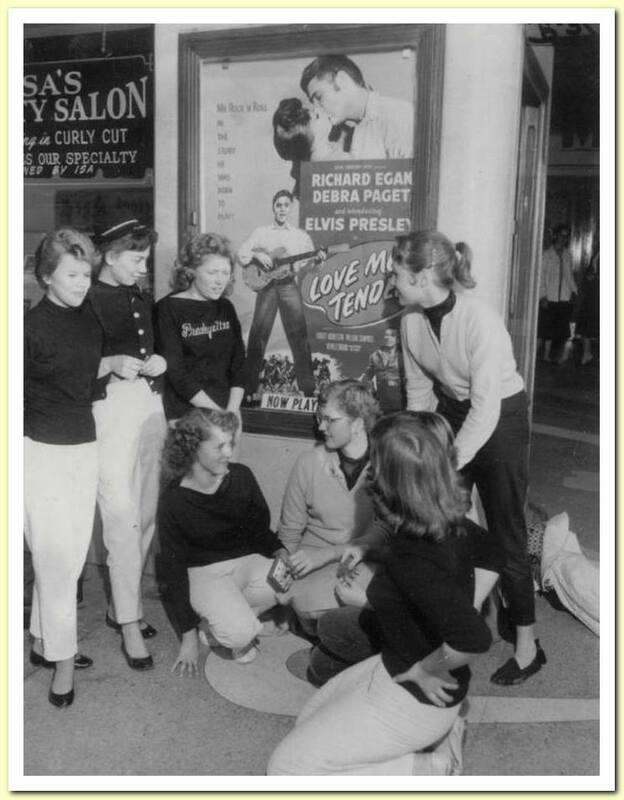 It appears to be taken in front of a cinema that is next to a beauty salon, and the girls are dressed up (in their working clothes? At least one of them appears to be an usher). 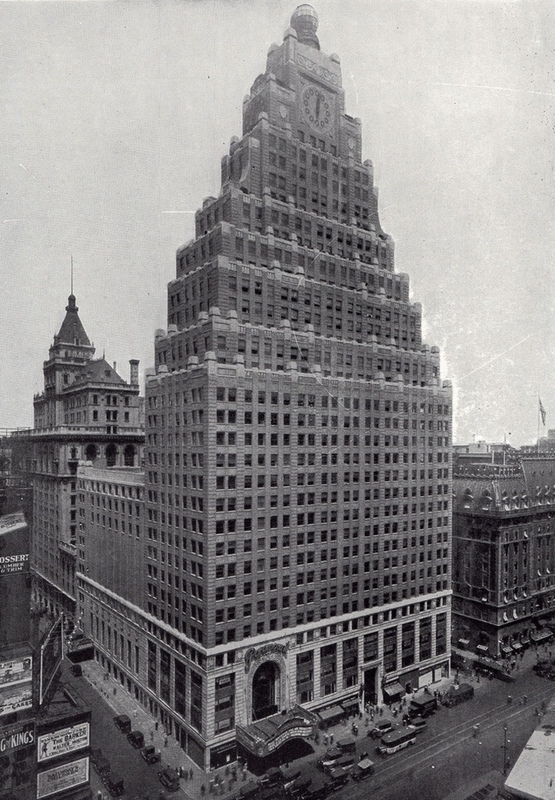 But the city and date are unknown to me. Josep Rulló (Spain) for sharing many rare (and color!) images. James V. Roy (USA) for his additional information. 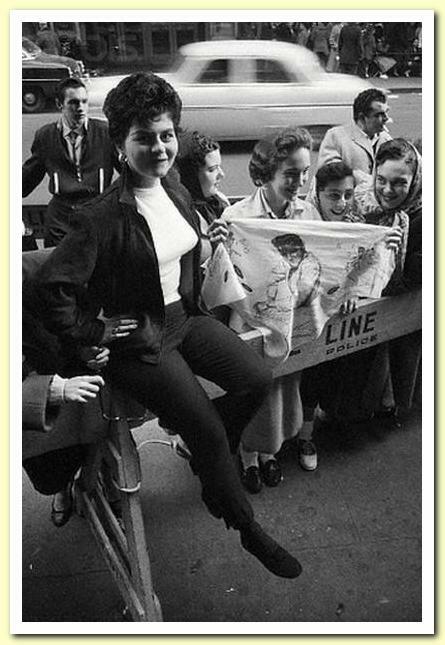 Check out http://www.scottymoore.net for all you want know about the 50’s Elvis. 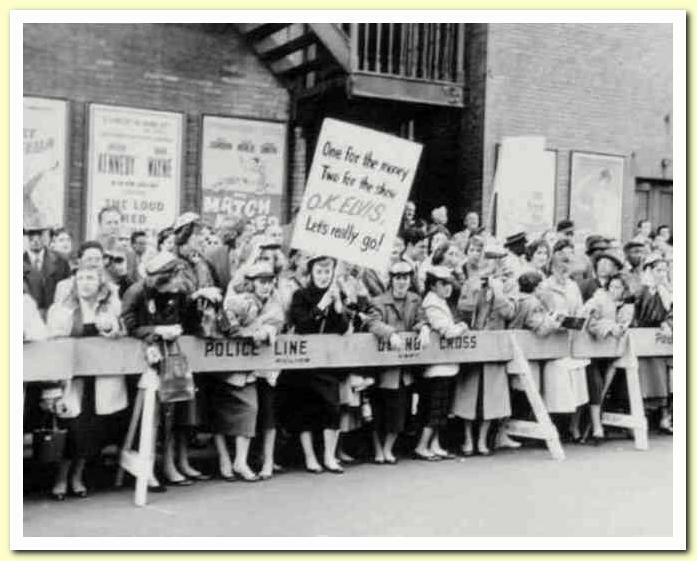 The color image outside Studio 50, was published in The Australian Women’s Weekly, courtesy of the National Library Of Australia. 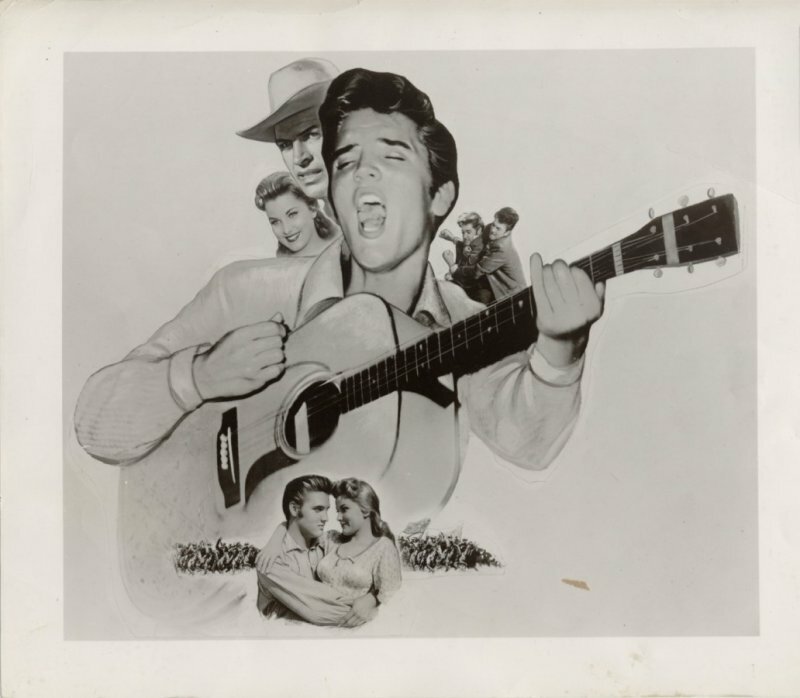 Some images were scanned from Marvin’s brilliant book, Elvis Presley 1956, which comes highly recommended. Maybe because the record and EP are on HMV, but I love this film. seeing some of the photos like reaaaallly big in size! A killer topic! from both LA and Houston. Those don’t turn up often. do what you’ve been doing since April of this year. n Roll monument for many years on the internet! singer & performer. Nothing more, nothing less. 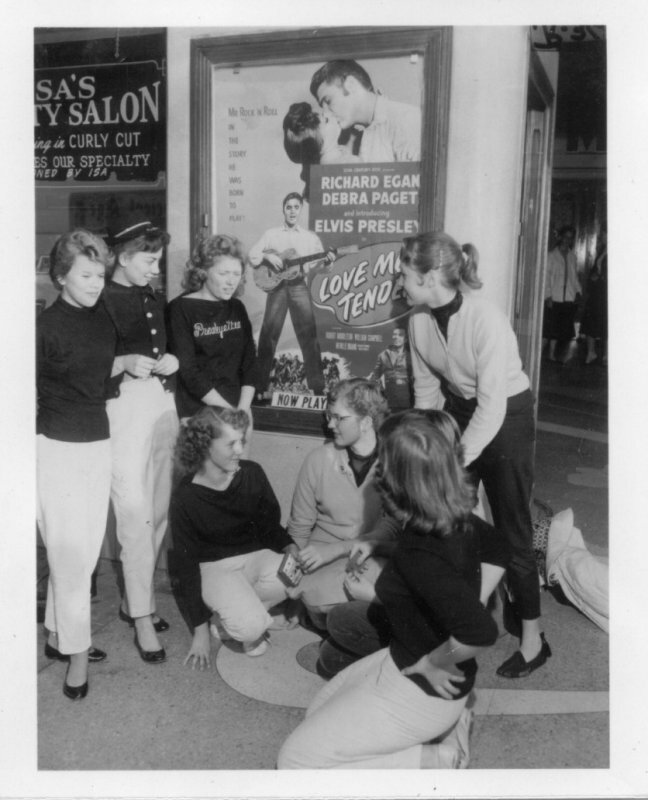 Pictures from LA and Texas never seen before, had no idea the Elvis cut outs was a kinda theme to promote the movie, certainly everything seems large, movie posters etc outside movie houses, I guess that was the hard sale, they certainly had a product to sell and promote, very interesting pics, thanks as always. I agree with you Ger. Cool stuff. 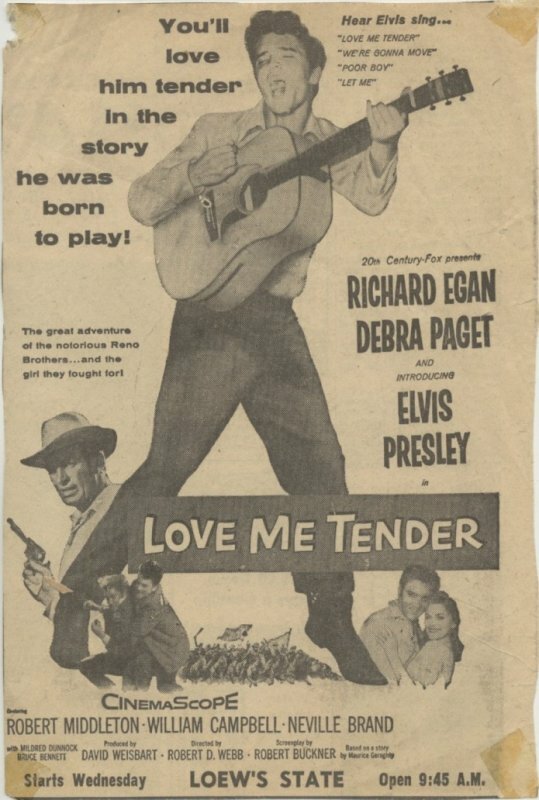 If I remember correctly, Heather Mozart has one of the large Elvis promos for one of the movies, I believe it was Love Me Tender. I’ll have to look. 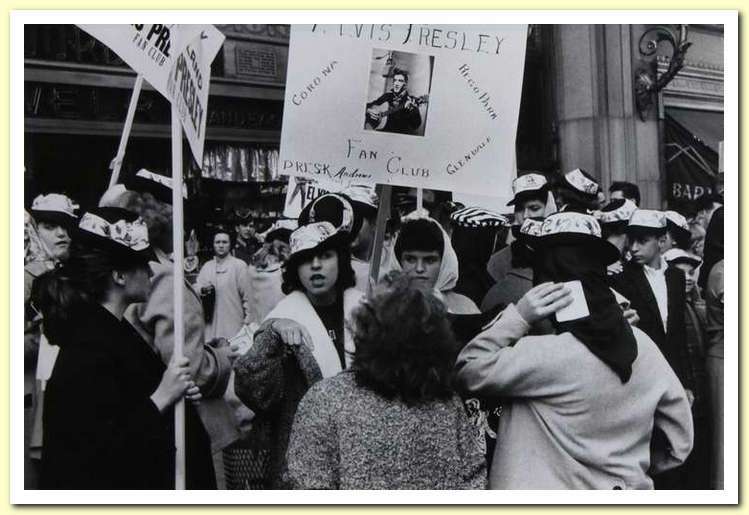 For the Record though, I believe the shot included here of the fans outside Studio 50 is for Elvis’ appearance on Ed Sullivan’s show in October, not the movie release. 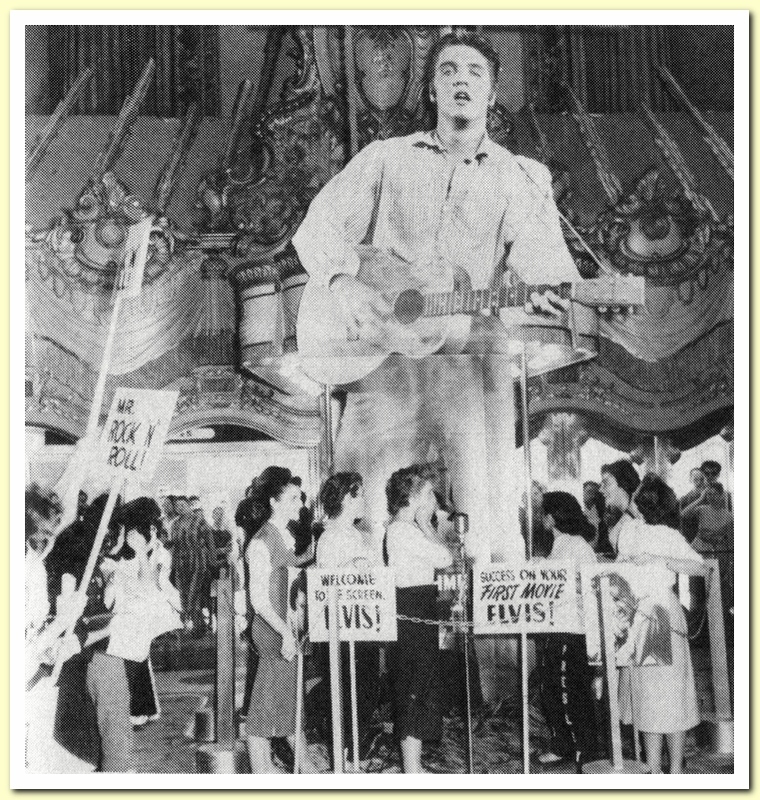 They are protesting the ending of the movie where Elvis dies (hope I didn’t spoil that for anyone) which prompted them to shoot the clip of him singing which was overlayed at the end. Ah! sorry. 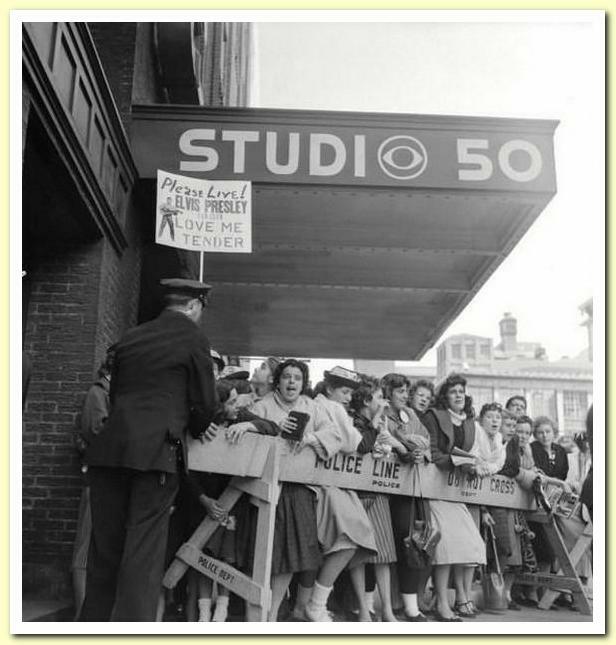 I scrolled past it and on the way back up stopped at the Studio 50 pic and only noticed the November date below it. 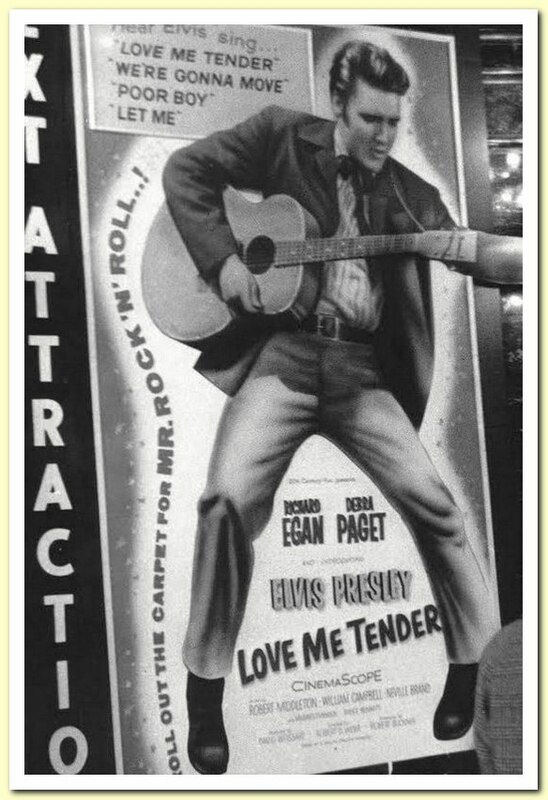 Another interesting point is the artwork that’s used for the NY promotion of the movie above the marquee shows Elvis dressed in his role from the movie but holding his leather clad Martin. In the West coast one they’ve corrected it to the actual movie prop. A keen eye for detail! But why would they have gone through the trouble of replacing the prop with the leather clad Martin? No idea. They did some weird stuff promoting that. Ger sent me some things years ago that showed ads and artwork that essentially took portions of the Tampa Armory Tonsil photo reworked for use in the movie. Great and interesting stuff, thanks! I have some Tonsil LMT artwork in the regular LMT topic in this section, and some other pics that I have lined up for a future update. But the 2nd one is totally new to me. Is this an original still? 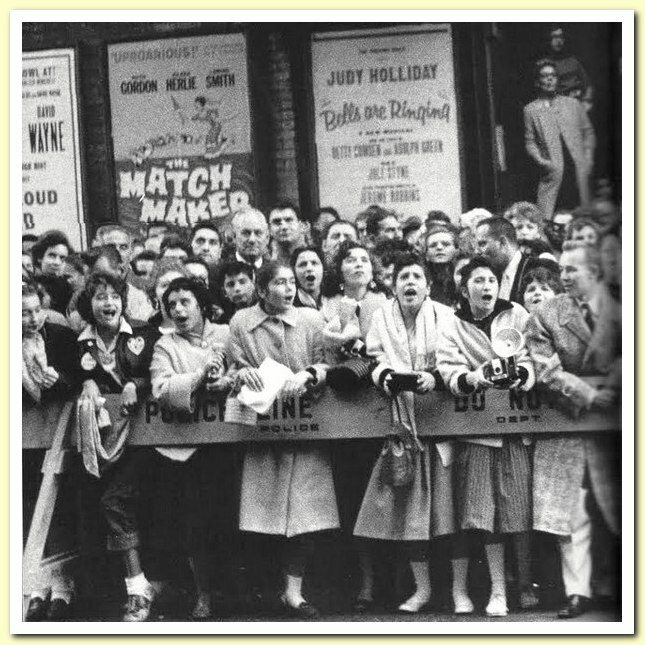 And the 3rd one, in front of the Beauty Salon, any idea where this was taken? Great photo, and I would like to use it in a future update of this topic, if that’s okay with you. I’ve no issues with you using it. It came from Ger and may have gone back to him. He might be able to tell you if its an original still or not. He might also know where that one near the salon was taken. I can only guess that because the ads he sent with it were from a “Loew’s State” it may have been one of them but no idea which one. For those not familiar with what the fook the Tampa Armory Tonsil photo is?! The color shot is fantastic and better than anything I’ve seen in a long while. Fabulous stuff. Great update Bob. Thank you. Keep up the good work Bob. Absolutely first class. Love seeing these pics all together, it’s a real time capsule capturing moment. Hadn’t seen the colour shots before. Fantastic! Well done, good work. Dang, thank you so much for posting this! This is fantastic. It was just what I’d hoped I’d find. Thank you for all your work. A lot of interesting articles here! A fantastic display of photos. Thanks for sharing. 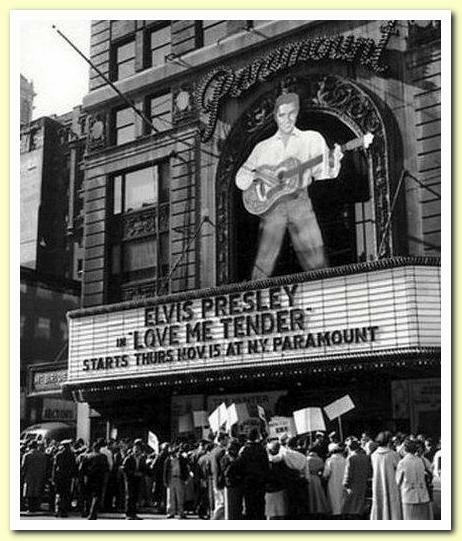 Whatever happened to the large Elvis cutout that was 40 ft tall and on the marquee for Love Me Tender at the Paramount theater? 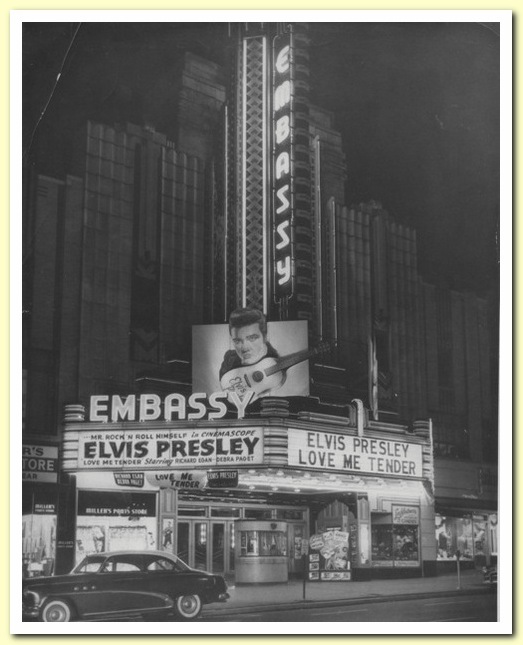 Yes that last picture was taken at Embassy theater in Fort Wayne, Indiana. We live in Fort Wayne and that is the Embassy. It is still here, restored and very beautiful. The doors are the same, overall it’s the same as the picture. Very proud of our theater. 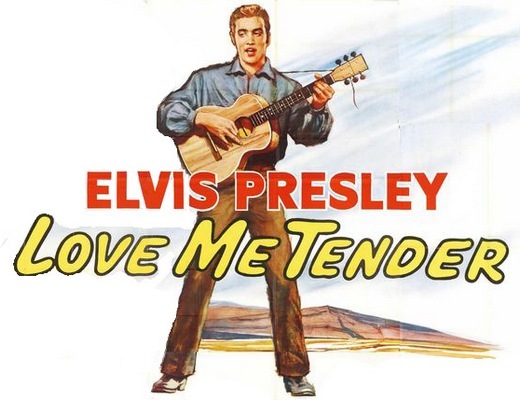 So happy to see it in 1956 Elvis Presley “Love Me Tender”. Was a real treat! 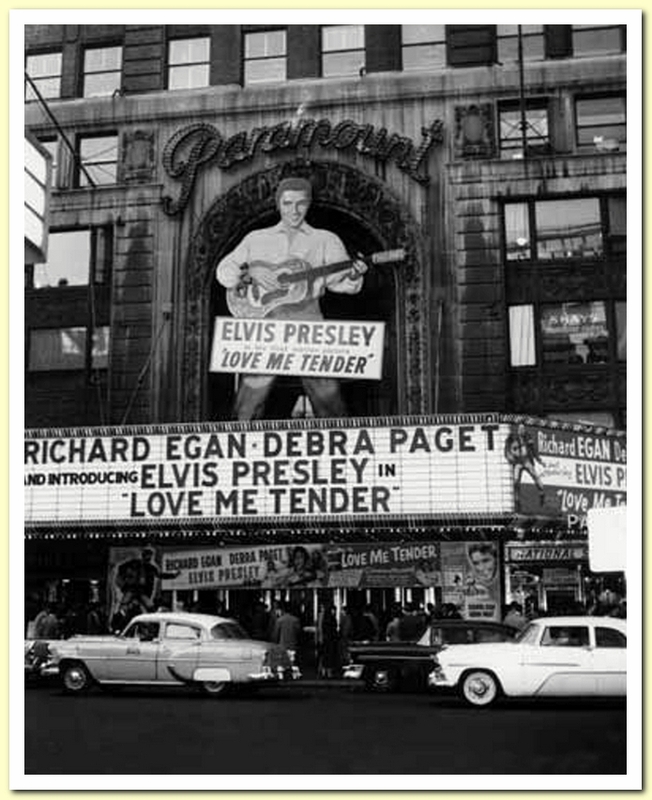 Also loved the pics from the PARAMOUNT theater in NYC! 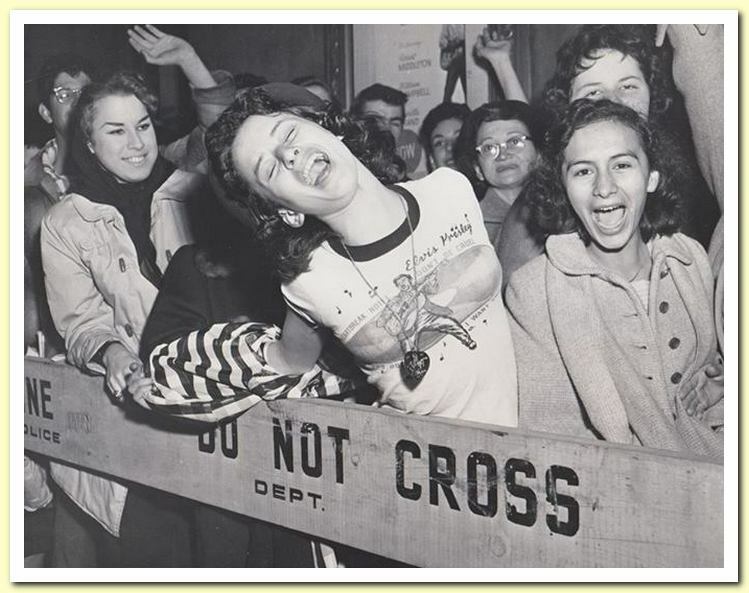 Thank you for the Blast from the past and wonderful pictures! !